You don't need a laminator to laminate a project! With these clear adhesive laminating sheets, anyone can produce great laminated results without investing in a machine. Laminating sheets allow you to achieve one sided lamination, or apply another sheet for a fully enclosed two sided lamination. They are available in letter size and in roll format and offer a fast and easy option for laminating the front of a document, sign or card. Simply peel of the adhesive liner and apply the sheet to your paper. It doesn’t get much easier than that. Scroll down and check out the options below. 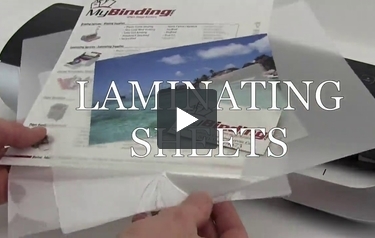 Laminates items up to 8.5" x 11"
Welcome to MyBinding video. If you’re looking for laminating sheets, you’ve come to the right place. Within the industry, laminating sheets are known as laminating pouches. These crystal clear laminating pouches are some of the best quality on the market and work with almost any pouch laminator. Just make sure that your laminator fits the right thickness of your pouch. We offer 27 different sizes of laminating sheets and a number of thicknesses, all the way up to 10 mil. A quick looking around on the website or giving us a call, you’ll see just how many different kinds of pouches that we carry. The finished product on every one of them is crystal clear visibility of your product that you’ve laminated and slightly rounded corners for texture. We sell them in packs of 100 and 500 so the price is great and we keep them all in stock so we ship them out the next day. We have the best customer service on the web and a guaranteed low price. When image matters, MyBinding.